Welcome to the Baloney Books® Store! Three books in the Baloney series are available for purchase now! Disponible ahora…cada libro traducido en español (ediciones en español)! AVAILABLE NOW...each book translated in Spanish (Spanish Editions)! 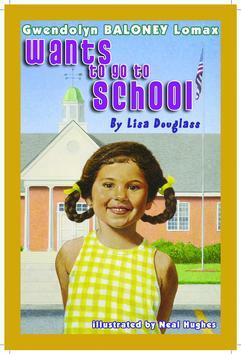 Gwendolyn BALONEY Lomax, the delightfully captivating principal character of Lisa Douglass’ series of books for children, wants to go to school. She spends her time wishing for the day she will get to go to the elementary school across the street. This short story introduces the charming character to new readers of the series. 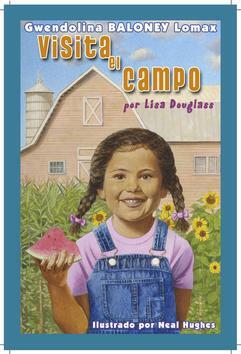 Young readers will be excited to learn about the character’s home life. This work is moderately challenging for the independent reader with some vocabulary that may spark questions (“siblings”, “concrete”). Beginning readers will love hearing this story read aloud. Gwendolyn BALONEY Lomax, the delightfully captivating principal character of Lisa Douglass’ series of books for children, visits her cousins in the South. The differences between city and farm life are illustrated in this quick tale. Young readers will be excited to learn about the character’s family adventures. This work is moderately challenging for the independent reader with some vocabulary that may spark questions (“asphalt”, “rind”). Beginning readers will love hearing this story read aloud. 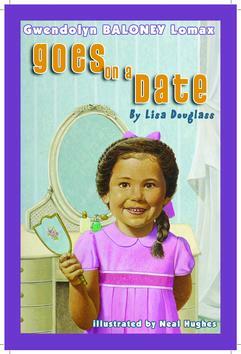 Gwendolyn BALONEY Lomax, the delightfully captivating principal character of Lisa Douglass’ series of books for children, goes on a date at the tender age of five. Her day starts off quite regularly, but ends in an exciting adventure with her sister and her sister’s boyfriend. This short story illustrates the simple family bond between mother, child, and siblings. Young readers will be excited to learn about the character’s family dynamics. This work is moderately challenging for the independent reader with some vocabulary that may spark questions (“dome”, “topper”). Beginning readers will love hearing this story read aloud. Click here to download the Baloney Books� Order Form. Lisa Lomax Douglass is a graduate of the College of Notre Dame of Maryland, where she earned a Bachelor of Science degree in Political Science, and Loyola College in Maryland, where she earned a Master of Engineering Science degree. She is a contractor for the United States Federal Government, serving as a software development project manager. Lisa's love of language arts started early. In fact, she studied Latin for five years in high school - a curriculum that included a full semester of Greek and German language studies. Those closest to her will say that Lisa is a true lover of storytelling and oral tradition. As the youngest grandchild, she is the keeper of the Lomax family history, applying her data management skills to research and illustration of her genealogical tree. What is most fascinating to Lisa is the lore that goes with each branch in that family tree. In her book series for children, Lisa tries to capture the spirit of her family lore while making the stories fully relatable to any child in any family.